Bronx, New York (November 12, 2015) — Bronx, New York is one of eight winners of the 2015 RWJF Culture of Health Prize awarded by the Robert Wood Johnson Foundation. The Prize celebrates the strides communities have made to ensure good health flourishes for all. The Bronx community will receive a cash prize of $25,000 in recognition of its commitment to building a Culture of Health. 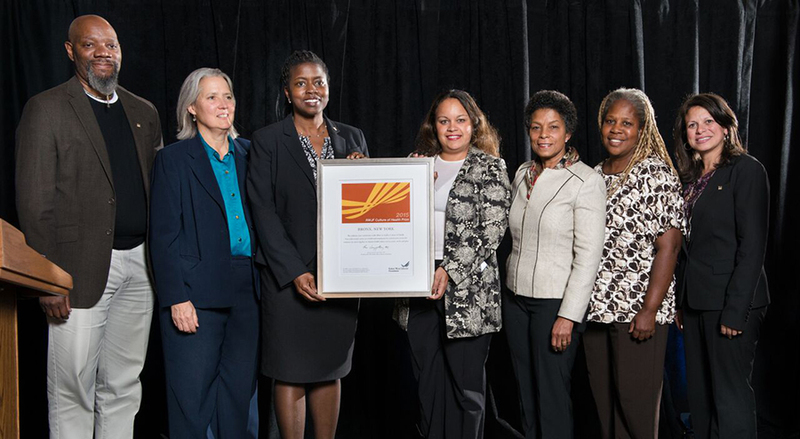 The Bronx was selected from more than 340 prize applications across the country. The other seven winning communities are Bridgeport, Connecticut; Everett, Massachusetts; Kansas City, Missouri; Lawrence, Massachusetts; Menominee Nation in northeastern Wisconsin; Spartanburg County, South Carolina, and Waaswaaganing Anishinaabeg (Lac du Flambeau Tribe),Wisconsin. Committing to sustainable systems changes and policy-oriented long-term solutions. Cultivating a shared and deeply-held belief in the importance of equal opportunity for health.